Recently, my teaching schedule has picked up a bit, and I have started 3 new courses. One of the courses is with an English school that provides a curriculum and materials, and one is a private tutoring gig, but the other course is, for the most part, completely open as far as content goes. Currently, I am facing the challenge of creating a course plan that will satisfy everyone: the participants (adult, business people), their company (that is sponsoring the course), and my company (that claims to have a creative, unique approach to English instruction). As I was looking through my textbooks for ideas, I came across David Nunan's Task Based Language Teaching (Click here for the Amazon page). 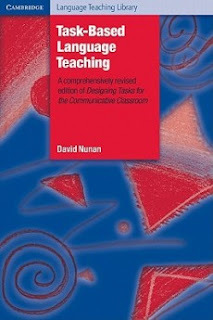 At the time we studied this book in my degree program, I remember thinking that the system Nunan sets out in the book was great, but still less appealing than the standard Effective Instructional Sequence that we typically used for lesson planning in the program (even though, in reality, they can both go together). However, in my current situation, faced with the simultaneous needs to teach concrete skills in English, to teach English grammar (without taking a traditional grammar teaching approach) AND to foster a discussion-like environment in the course, Nunan's task based language teaching model seems to be a perfect solution. In the model, each unit is based around a pedagogical task – a real world activity performed in the safety of the classroom. Building up to that task, the teacher scaffolds activities and lessons that will develop the skills needed for the students to successfully complete the task. Obviously, there is a lot more to this book that just the model outline, but I can't do it justice in a blog post. I recommend looking into the book if you are teaching business English without a pre-set curriculum, because it allows you to focus on the specific language tasks (sending email, having a meeting, interviewing, etc.) that they will encounter. If you want to see the Table of Contents and a little of this first chapter, here is a link. Also, I found this blog that focuses on Task Based Language Teaching. It has not been updated recently, but the posts that are there already have some good ideas.